3D – What’s the Dimension This Week? What a 3D year it was in 2011 with well over 20 3D films. Although the process has gotten better and the experience is bigger, the idea is still a marketing gimmick to sell more tickets at a raised priced. 3D like remakes and sequels is not a new idea just an updated rehash. With that being said Disney’s 100M score with Lion King had spurned a two 3D pic a year strategy for the studio. These have since been squashed. IMAX appears to be the only high end format that continues to grow and allow raised ticket price experience. I’m not knocking our tech update game just pointing out it nothing new. I loved the way masters like Hitchcock used 3D in the old days with Dial M with Murder and Cameron has mastered the same in 2009 with Avatar. 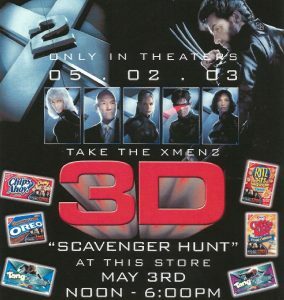 Heck I even used 3D with an X-Men 2 scavenger hunt at Wal-Mart. 3D Branded glasses with 3D packaging and a 3D X-Men 2 branded poster give-away in early 2000’s. My question is do you have 3D in your strategy, or are you going to get involved with 3D when its newness fades or moves to holograms. As a brand warrior you need to make sure your team is looking for ideas ahead of the curve. Wayne Gretsky claimed his excellence at Hockey was that he always knew where the puck was going to be vs. chasing it. So move your cheese constantly, be alert, stay engaged and consider all things for your marketing mix. I used to fret at the changes from 8 tracks to cassette, VHS to Beta, VHS to DVD to Blu-Ray, on-line from brick n mortar, and hard-line to streamline. Keep all formats on your radar. A fully integrated program playing in all dimensions is the way for your brand to touch the universe, and not just a landscape. However with all this being said buy some stock in eye glass companies, because I’m not sure how this will all play out on our eyesight. There is some thought that if we were to see it 3D maybe we would have been made that way in the beginning.